NBCUniversal Domestic Television Distribution has cancelled The Meredith Vieira Show. The syndicated talk show will end after its current second season. On December 28, we reported that The Meredith Vieira Show could be coming to an end. Now, it is official. This cancellation comes on the heels of news that The Ellen DeGeneres Show has been renewed through the 2019-2020 television season. What do you think? Do you like The Meredith Viera Show? Do you think it should have been cancelled or renewed? More about: The Ellen DeGeneres Show, The Ellen DeGeneres Show: canceled or renewed?, The Meredith Vieira Show, The Meredith Vieira Show: canceled or renewed? 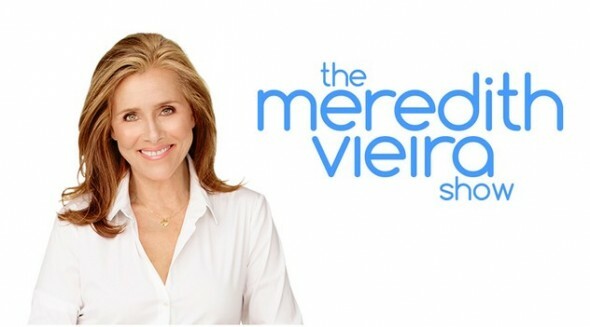 The Meredith Vieira Show: Cancelled Soon? No Season Three? No, the show should not have been cancelled. Meredith is a terrific journalist and great show host. Her laugh is infectious and genuine. The show had interesting guests that weren’t seen on every other show. I think Meredith is a class act…she is the perfect blend of intelligent, entertaining and fun. It’s not all about celebrities but true life heroes and her recognizing of those people and giving back to those in need speaks volumes of the type of person she is! Sad and so sorry to see her show go! The Meredith viewers show should not be cancelled. Meredith is very entertaining and fun to watch. Bring meridian and her crew back. Really good show & watched it everyday! Meredith is great & genuine, loved her show topics, her warmth, humor & generosity! I MISS IT & HER ALOT!!! No, Meredith’s show should have not been cancelled. I loved the What’s Hot Now session. Shame on the execs who made the decision. No, Meredith’s how should not have been cancelled. It was refreshing and she is so down to earth. I loved the What’s Hot session. Love Meredith Viera & love the What’s Hot Now segment but the show needed to rein in the loud interrupting people on the panel and everyone knows who she/ they are. You couldn’t understand what everyone was saying, you couldn’t hear due to Yameneika’s loud sometimes almost screaming interruptions. Lilliana was almost as bad at times. Having Mario on was almost worse because he was almost manic screaming. It’s a shame because I love Meredith and the segment was fun and interesting. I liked that show. I think it should have been renewed. Maybe NBC could pick it up for a third season. I loved hot topics and will miss the show so much! What will happen to the hot topics group?